Muay Thai event All Star Fight 2 is held on Saturday September 30 at Workpoint Entertainment Studio in Bangkok. It follows the debut the promotion made in August, featuring some of the most notable Thai fighters, including famed Buakaw Banchamek. To date, no match ups have been formally announced for the second show. However, according to Yokkao.com three fighters have been confirmed. The list includes Buakaw Banchamek, Pakorn PK Saenchai and Manachai Yokkaosaenchaigym. All three battled out at the inaugural event last month. Buakaw stopped French Azize Hlali in the first round. Pakorn took the decision against Brazilian Julio Lobo, while Manachai similarly defeated Vahid Shahbazi of Iran. The names of their opponents at All Star Fight 2 yet to be known. 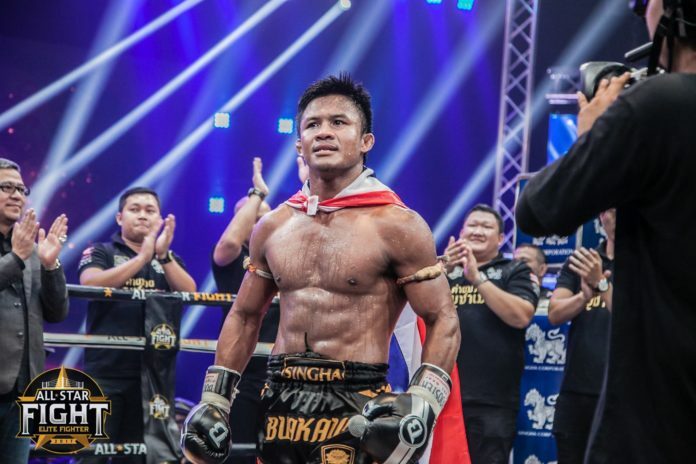 Buakaw Banchamek (230-23-12, 69 KO) is riding a four-fight winning streak since last December. He claimed the victories against Belarusian Andrei Kulebin, Chinese Tian Xin and Kong Lingfeng, and the most recent Azize Hlali of France. The resume of Pakorn includes the victories against Morgan Adrar, Aleksei Ulianov, Jimmy Viennot among others. Manachai is a rising name out of Thailand, representing a new generation of Muay Thai elite. Earlier this week the organization released a teaser trailer for the upcoming show. Other fighters as well as the match ups are expected to be announced in the coming weeks. The current line up can be found below.